To keep my focus on a project, I often search around for pictures of my modeling subjects. Here are two of them. 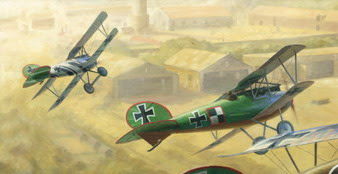 The Albatros D.Vs of Rumey and Konnecke. Well, it's time to get down to the nitty-gritty. I clipped the remaining parts from the sprue, and was shocked to see that there was so much left to do! Cabane and interplane struts, landing gear, tail skids, props, exhaust stacks and machine guns. Yowza. Those tires...when I get to them...will definitely be the worst part. Anyway, this week, the struts went in and the top planes went on. I also got to the end of the decalling. Baumer has his edelweiss. Sigmann has his tailplane and stars finished. Flashar's dragon tail is on and Rumey has his white stripes. This week I'm guessing I'll be putting the landing gear on and get those props painted. We'll see how close I get to putting this monster to bed. Well, I lost a week at the hobby table with a business trip down to Austin, and then a weekend with family in Calgary...but the crazy D.V build continues! This past week I was able to finish off the lozenge wings of Neckel's Albatros and I've attached the Jasta 5 tail feathers. Those Eduard Jasta 5 "red piping" decals are hell to work with. So fussy. Anyway, lower wings are now glued on and I feel like I'm in the home stretch. As I'm building these kits, I have to say that Sigmann's D.V is turning out to be my favorite. The markings are just spectacular. Next up will be guns, struts, top wing attachments and landing gear. 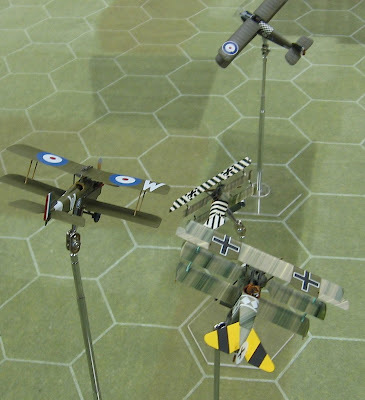 On the subject of Canvas Eagles, we've been playing some more at the club, and I had an opportunity to get the triplanes out for a spin against some of Matt Robinson's campaign pilots. 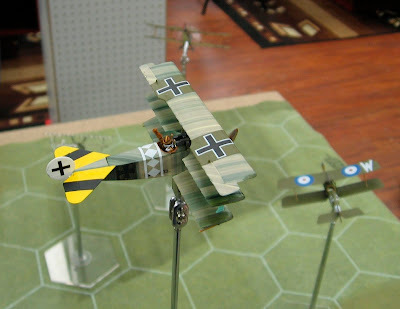 Of special note is that Matt just finished off his resin Sopwith Dolphin kit and flew it at the club a few weeks back. A beautiful build, which you can just see climbing away from trouble with a couple of triplanes on his tail. The title of this week's build blog should be "All Rib Tapes, All The Time." Most of my hobby time this week was spent working on the wings of Sigmann's D.V. I've stalled out on several WWI biplane projects in the past simply because I couldn't stand the tedium of applying rib tapes. However, I'm determined to get through this eight-plane build...two of which require rib taping...so I'm sucking it up and plowing through them. I also got the fuselage markings onto the two Jasta 12 D.Vs. So, the end of this week doesn't look very much different than the end of last week. This week coming up I'm down in Austin, so progress on these builds will be put on hold for about five days. No problem...I'm feeling pretty confident that I should be mostly done this project by the end of January. Well, a new bout of Canvas Eagles nuttiness is sweeping my hobby table into the New Year. Over the holidays, I started a pretty ambitious project: Eight 1/72 scale Albatros D.V fighters. I look at it this way...I just finished six Fokker Dr.Is; that's 18 wings of work. Eight Albatros fighters are only 16 wings of work...easy peasy...right? Here the fuselage halves are awaiting glue, and the wings are base painted. Fuselages are closed, puttied, sanded and base coated. For the eight builds, four have plywood fuselages, two are light grey, one is white and one is green. Here, fuselage sections are matched with wings and tails...OK, now which eight builds am I doing anyway? Time to work on a big-time unit. I chose to do a number of aircraft from Jasta 5, Germany's 3rd highest ranking wartime fighter unit. Jasta 5 accumulated 253 aerial victories and only lost 21 pilots in combat, killed and captured. Their Albatros fighters, from the summer of 1917 through to the spring of 1918, were some of the most fancifully decorated aircraft flying over the Western Front. Five of the eight builds will be from Jasta 5. The commanding officer of Jasta 5 through most of the Albatros period was Oberleutnant Richard Flashar. His dragon-marked D.V is well known and well documented. He flew this plane through the last half of 1917 and into 1918. Unlike most German fighter units in the First World War, the commanding officer of Jasta 5 was not their most prolific scorer. In fact, Flashar ended with war with only 2 victories. However, his fame comes from the fact that he scored Germany's first aerial combat victory of the war, back in 1914. He downed a French aircraft with a shotgun. On the other hand, Leutnant Fritz Rumey was Jasta 5's most prolific aerial fighter, scoring all 45 of his wartime victories with the squadron. He flew several different Albatros fighters...this one was known to be active in the Spring of 1918. Rumey was wounded twice in 1918, and was eventually shot down on September 27th. He bailed out of his Fokker D.VII, but his parachute failed to deploy. He fell to his death. Paul Baumer was a very successful fighter pilot with three of his 43 victories scored with Jasta 5 in July, 1917. He was then transfered to Jasta 2, where he remained for the rest of the war. There has been much debate over the colors used on Baumer's fuselage. This rendering shows the edelweiss flower painted over a background of darker red. Some think the darker band might have been black. I chose black for this build. Baumer became a dentist after the war, but he also worked as a stunt pilot and eventually he had his own aircraft manufacturing company based in Hamburg. During an aerobatic display in Copenhagen in 1927, Baumer crashed his plane and was killed. 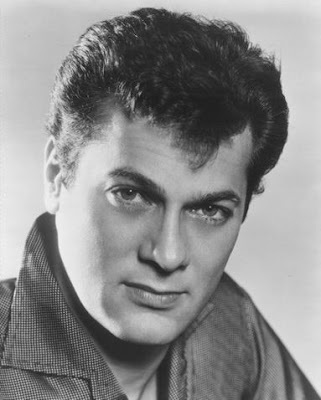 Doesn't he look like Tony Curtis? Otto Konnecke scored 33 of his 35 victories with Jasta 5, from May '17 through to the end of the war. He flew several green Albatros fighters during his time with the squadron. Here Konnecke (second from left) poses with his ground crew in front of one of his green Albatros D.Vs. Otto Konnecke survived the war. He became a pilot with Lufthansa in 1926 and was a commander of flying schools during the Second World War. He lived in Germany after the war and eventually passed away in 1956. Ah, an unidentified Jasta 5 plane with an unknown pilot. However, I couldn't resist doing this very simple paint scheme...particularly since I had a red fuselage band decal from another kit I could use! This aircraft was recorded as being active in the squadron over the winter of '17/'18. OK, time to leave Jasta 5 and move on to two builds from Jasta 12...again, these would be aircraft flown in late 1917 and early 1918. 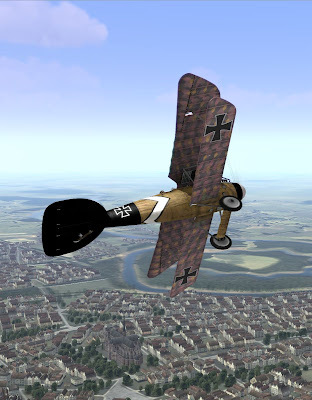 The first is flown by Leutnant Ulrich Neckel. He scored 20 of his 30 victories with Jasta 12. Ulrich Neckel eventually went on to command Jasta 6 and received the second-last "Blue Max" medal to be awarded...just three days before the end of the war. Ten years later, in 1928, he died from tuberculosis in Italy. This is another documented Jasta 12 Albatros. Unfortunately, we don't know the name of the pilot who few this fighter marked with the stylized Star of David. For the final build, I decided to do this very striking late-war Albatros D.Va from Bavarian Jasta 78. This squadron was small and obscure, producing no pilots of renown. However, one has to admit that the unit markings were very beautiful. This plane was flown by Vizefeldwebel Michael Sigmann. Sigmann, seen here in flying kit, scored no aerial victories. He was wounded in the arm during combat in August, 1918 but was able to land safely and survive the war. Well, the holidays are drawing to a close and work on these models will start to slow down now. Here is the current state of the builds. Most of the planes should be recognizable at this point. I still have some more fuselage and wing decaling to do, but most of the heavy lifting is behind me. Up next is final component painting, strut work and then assembly.